I know the rest of the country is getting hammered with really cold temperatures and snow but out here in the Pacific Northwest, we've enjoyed several unseasonably warm and sunny days recently. The past two weekends have been stunning so my mind is spinning with ideas for projects. Thanks to a friend posting a picture of a charming greenhouse on Facebook, I got to thinking about the greenhouse I built in the garden a couple of years ago. It has been a wonderful addition but when I built it, I had planned on taking it down during the summer months so it wouldn't obstruct the view of the garden from the pergola. It kept my tomatoes so happy though that I decided that was more important than the view. The other compromise in our gardening spaces has been the back garden which, with the exception of the cute bright fence crafted out of painted crib parts, isn't all that great looking. 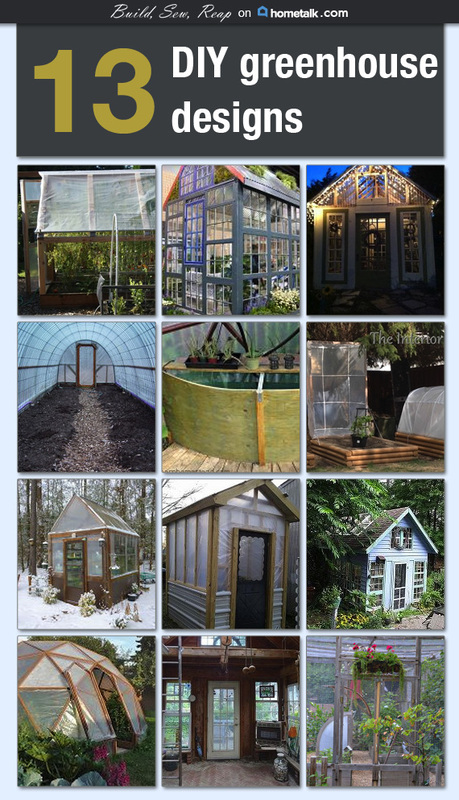 Do you have a greenhouse you've blogged about? I would love to see what you've done. Please comment here with a link or you can even post pictures directly on the Build, Sew, Reap Facebook post so we can all be inspired. Great DIY Greenhouse Ideas! From now I can make my own Greenhouse by using all these tips as mentioned above in detail. Personally, I love engineered greenhouses. Thank you so much and keep posting things like this. Thanks for your greenhouse idea, just i have a plan!